The annual Justice Awards celebration recognizes exemplary commitment to the pursuit of a more peaceful and just society. Proceeds further Western Justice Center’s work to build a more civil, peaceful society where differences are valued. Justice Awards Master of Ceremonies Petri Hawkins-Byrd (an actor known for his role as bailiff on the television court program Judge Judy. The Honorable Vilma Martinez and former U.S. Ambassador to Argentina presents the Champion of Justice Award to Thomas A. Saenz, Esq., President and General Counsel of Mexican American Legal Defense and Educational Fund (MALDEF). Thomas A. Saenz is President and General Counsel of MALDEF, the nation’s leading Latino legal civil rights organization. He is also a new member of the WJC Board of Directors and is a founding director of ENCOMPASS. Tom is known for his legal and policy work, for standing up for and litigating basic civil rights and for working for peace and justice. Tom is without question a Champion of Justice. Manatt, Phelps & Phillips, LLP partner and WJC Board Member Craig de Recat, Esq. 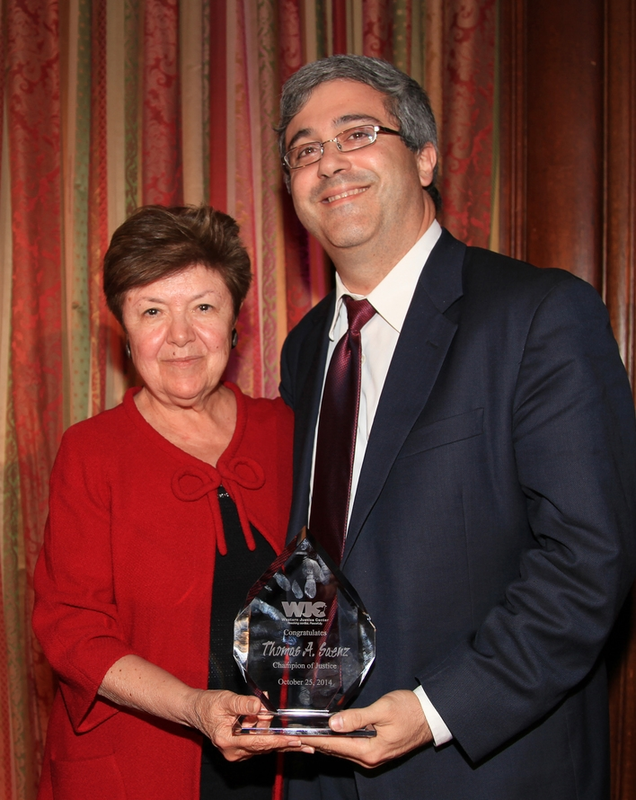 accepts the Defender of Justice Award from WJC Executive Director Judge Judith C. Chirlin (Ret.) on behalf of his firm. Manatt Phelps & Phillips, LLP, has established a reputation as a leader in pro bono innovation, developing groundbreaking programs and securing meaningful change on behalf of its pro bono clients. Firm professionals and staff are actively involved in pro bono representations, devoting significant billable time and resources to hundreds of individuals and not-for-profit organizations across the nation unable to afford traditional legal fees. Manatt is working with WJC to build a more civil, peaceful society where differences are valued. WJC is proud to recognize Manatt as a Defender of Justice. Manatt is one of the nation's leading law and consulting firms, with offices strategically located in California (Los Angeles, Orange County, Palo Alto, San Francisco and Sacramento), New York (New York City and Albany) and Washington, D.C. Manatt has Hollywood roots, D.C. clout and Wall Street cred. The firm represents a sophisticated client base – of Fortune 500, middle-market and emerging companies – across a range of practice areas and industry sectors that include healthcare, energy, entertainment, financial services, real estate, media and advertising. Learn more at manatt.com. Kaiser Permanente SVP & General Counsel Mark Zemelman (r) accepts the Advocate of Justice Award on behalf of Kaiser Permanente from WJC Board Member Craig de Recat. Photo credit: Rick Kraemer. Kaiser Permanente is an Advocate of Justice. For more than a decade, Kaiser Permanente and WJC have worked together to create healthier schools and communities. For example, Kaiser Permanente grants have funded WJC's annual Peer Mediation Invitational for elementary, middle and high school students and also The ABCs of Conflict training for hundreds of teachers in Southern California. As a result, thousands of students, staff and community members have learned to resolve their differences in a collaborative manner.